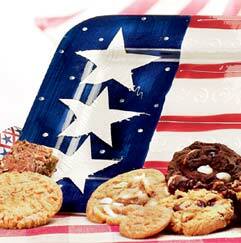 Our patriotic ceramic platter (11 1/2"x14 1/2"x1") is delivered with your choice of two dozen cookies or one dozen cookies, six brownies and 24 assorted Nibblers®. Order early...quantities are limited. Cookie flavor selection only applies to the cookies. 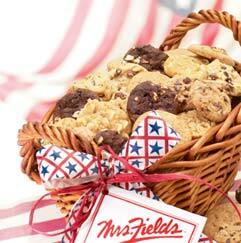 The Nibblers® come in a pre-selected assortment. Patriotic Costumes, Accessories and more.